Thank you for your support in what’s been a spellbinding year for us all. Ideal or real, theory or practice, spirit or flesh; Whatever the space(s) that will get you through times that will reveal the depth of our character, may they be filled with and fueled by the highest, most powerful energy known to the imagination and heart. One of the many measures of the hardness of our times can be found in South Texas, where even the simple act of bringing Christmas cheer to children can sometimes require more than just a spirit of charity. In some cases, it often requires the kind of stonecutter’s determination one finds in a (Charles) Dickens tale, the determination of someone like Luissana Santinbañez. “The fact that we’re able to bring these toys to children is a huge victory. It took an incredible amount of struggle” says Santibañez, a 25 year-old San Antonio resident who is one of the organizers of a toy drive for children detained along with their immigrant parents behind the concrete walls and barbed wire fences of the T. Don Hutto Detention Center. The “we” Santibañez mentions includes a very broad and diverse group of people of numerous religious, racial, ethnic and class backgrounds, many of whom had never been involved in immigrant rights or any other activism. The determination exemplified by Santibañez, who got involved in immigrant detention issues after her mother, a former permanent resident detained and eventually deported for allegedly transporting undocumented immigrants, is spreading across the entire country; It mirrors how the plight of immigrants in the United States has given rise to a different kind of hope, a hope rising out of the darkly fertile soil of very hard times. “I’m committed to this because of people like my mother,” she says, her throat trembling with conviction as she also describes how she and her four siblings must rely on one another now that they are “left without a mother.” In a country facing colossal challenges – poverty and economic divisions not seen since the Great Depression, fabulous political and corporate corruption surpassing anything seen during the Gilded Age, panic and fear of epic proportions – immigrant stories in the United States are inspiring people around the world. Consider the widely-watched factory takeover staged by Vicente Rangel and the other 200 mostly immigrant (80 percent) workers laid-off on December 5th by owner the Republic Door and Window manufacturing plant in Chicago. Demanding severance and accrued vacation pay after the factory owner gave them just three days notice before closing the plant down, Rangel and his fellow workers’ took over the plant and, in the process, garnered global attention. And in an act not seen from a President or President-elect since worker unrest forced Franklin Delano Roosevelt to speak about the growing worker militancy of the 1930s, President-elect Barack Obama, made favorable mention of the factory takeover in a speech delivered shortly after it happened. Media outlets from around the world are still calling Rangel’s union; Workers from across the country are also calling the United Electrical, Radio and Machine Workers union to speak with Rangel and other workers who have become rock stars of the labor movement, something that still surprises Rangel. Twenty years after he migrated from Michoacan, a region with a long tradition of labor and political militancy, Rangel found himself drawing on the traditions of struggle of both his rural homeland and his urban home. “When we were in the factory, I thought about the great ones who came before us – Emiliano Zapata, Pancho Villa and others were accused of being criminals like immigrants are now. I also thought of what Martin Luther King had to suffer through and how big all these struggles are,” said Rangel from his union hall. “Respeto, dignidad. We were not asking for what we didn’t deserve. Apparently, Rangel and the Republic workers’ holiday hope is already generating hope across geographic, cultural and linguistic boundaries. While he is motivated by events in the Chicago factory, Gan also sees his own fight with New Ong Sang as a way to encourage others, especially because of the feeling of “I can’t pay rent, let alone buy gifts for holiday,” he says. This pic taken at the Parthenon in Greece makes your day. In the face of the violence, corruption and other anti-democratic practices of the Greek government (including the shooting of a 15 year-old boy), students there are taking matters into their own hands by calling on all of us to resist-and they do so in 4 languages (Greek, Spanish German and English) no less! 3,000 years after this most sacred symbol of western democracy was built by slaves, prisoners and others denied citizenship (also known as ἰδιώτης, idiōtēs in Greek, the origin of our term “idiot”), we are, it seems, still searching for ways to realize the monumental dream of democracy. 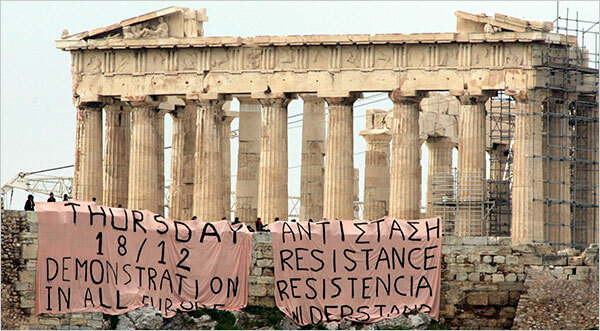 I find the image of these young descendants of ancient Greek citizens and “idiots” unfurling their multilingual calls for global “resistance” in front of the sublimely-proportioned arches and columns of the Parthenon most inspiring; Reminds me of how the heart of the student has always and forever provided us with the golden ratio of great change. Whatever your age, let the student in you rise to the urgent occasion of change in Greece, in the U.S. and across this troubled planet. Newly Proposed Interior Secretary Salazar: Already Obama’s Most Controversial Cabinet Choice? Just hours after Barack Obama’s announcement of Ken Salazar as his choice for Interior Secretary, denunciation of and opposition to Salazar have already turned the Colorado Senator in to the most controversial of President-elect Obama’s many cabinet designees. This story in NPR ,”Environmentalists Fuming Over Salazar’s New Post”, describes the growing disillusion in the environmental community about the Interior Secretary designate Salazar, who Kieran Suckling, head of the Tucson-based Center for Biological Diversity (CBD) said, “is very closely tied to ranching and mining and very traditional, old-time, Western, extraction industries. We were promised that an Obama presidency would bring change.” A scathing press statement (see below) released by CBD includes a litany of pro-polluter anti-environmental positions taken by Salazar, including his vote not to repeal tax breaks for Exxon-Mobil and his vote for oil drilling of the Florida coast. Whether or not these rumors do, in fact, materialize and become newsworthy, it will be interesting to see whether Latino groups come out in support of Salazar as they did during the Senate hearings around the appointment of Salazar friend and ally, former Attorney General Alberto Gonzales. Salazar, National Council of La Raza leader, Janet Murguia, and the leaders of other Washington-based Latino organizations came out forcefully in support of Gonzales even after revelations of the former White House Counsel’s role in providing legal facilitation for the acts of torture and humiliation at Abu Ghraib garnered international attention. Salazar and other Latinos in Washington rescinded their support for Gonzales in the final months leading to Gonzales’ resignation. 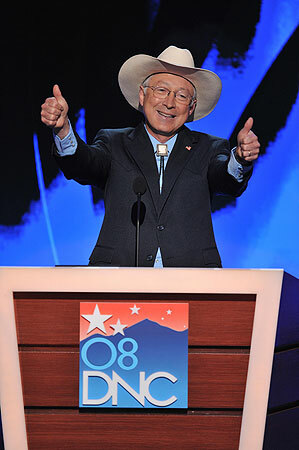 selected Sen. Ken Salazar (D-CO) as the new Secretary of the Interior. regulations in order to avoid or eliminate environmental protections. – voted against increased fuel efficiency standards for the U.S.
affairs, federal lands and water, timber, and fish and wildlife issues. at his Senate confirmation hearing. This article in the Denver Post states that President-elect Barack Obama has chosen centrist Senate Democrat Ken Salazar (D-Col.) as the next Secretary of the Interior. As noted in this previous post, Salazar comes from the pro-corporate Democratic Leadership Council (DLC) wing of the Democratic party and was, until may of this year, one of the staunchest supporters of disgraced and scandal-ridden former Attorney General Alberto Gonzales. If confirmed to be true, the Salazar appointment will further prove growing suspicions among progressives, who fear that Obama’s true colors are the reddish blue hues of DLC Democrats like Rahm Emanuel, Bill and Hillary Clinton and the other right-leaning Democrats like Janet Napolitano who will make up the Obama cabinet when approved. News of a possible Salazar appointment will likely stir continued discussion that about the “Clintonization” of the Obama cabinet. By appointing Salazar, a member of the conservative Democratic Leadership Council (also see DLC website) Obama would probably also draw strong criticism from progressive and Latino constituencies for the Colorado Senator’s controversial positions. And after voting in the full Senate to confirm Gonzales, Salazar, like the leaders of National Council of La Raza, LULAC and other Latino Gonzales supporters, remained silent about the many scandals at the Justice Department – controversial policies around torture, the right of habeas corpus, and the NSA’s warrantless wiretapping program. Only after the scandals and criticism surrounding Gonzales and the Justice Department rose to massive levels did Salazar call for Gonzales to resign in May of this year. A Salazar appointment will likely not do much to satiate concerns about what progressives worry are the overly-centrist Obama appointments to date. Salazar has draw strong criticism among progressives for several of the positions he has take including his support of the Patriot Act and his support for the candidacy of Conn. Senator Joe Lieberman in his 2006 race against popular progressive Ned Lamont. Discussion and debate around who the Obama Administration should appoint to lead the Department of the Interior (DOI) reveals divisions among the tribal nations sharing land with the United States. Tribal nations and tribal leaders are divided among 3 candidates rumored to be under discussion by the Obama transition team to lead the DOI, which manages relationships with and programs targeting the country’s Native American nations: Congressman Raul Grijalva (D-AZ), Congressman Mike Thomspson (D-CA) and the most recent entry, museum director and former Clinton Assistant Secretary of the Interior, Kevin Gover, who is also a member of the Pawnee Nation. While recent rumors of a possible Gover DOI appointment have created a buzz in certain sectors of the Native American community, these rumors have also exposed deep rooted divisions among and conflict between tribal nations-and between the tribal nations and the U.S. government. The Karuk Tribe of northern California has come out strongly in support of Thompson and Grijalva has the support of more than 7 tribes, including Tohono O’odham nation, the Hopis and the Navajo nation, the country’s largest tribe with over 300,000 members. A possible Gover candidacy will likely bring him considerable Native American support – and at least some Native American opposition. A judge in a class-action lawsuit filed by a group of Native Americans against the DOI filed during the Clinton Administration, found Gover in civil contempt of court for failing to produce documents and for deceiving the court about the DOI and Bureau of Indian Affairs management of Indian trusts (the judge was later removed from the case.) The lawsuit alleged that the Bureau of Indian Affairs lost millions of dollars owed to hundreds of thousands of American Indians as part of treaty obligations assumed by the United States . The 1996 case involving Gover, Cobell v Kempthorne, has never been settled, but Elouise Cobell, a member of Montana’s Blackfeet tribe and the lead plaintiff in the suit, still opposed Gover’s appointment as head of the Smithsonian Institution’s National Museum of the American Indian for his role in what she considers the mismanagement of the trusts. While these are only just rumors, this information should at the very least make us look more closely at how Congressman Mike Thompson’s record fits President-elect Obama’s promise to bring hope and change to the over 500 million acres of surface land and over 1.7 billion acres of the Outer Continental Shelf that fall under the purview of the Secretary of the Interior job Grijalva and Thompson are being considered for. The measure of change and hope in the work of the Department of the Interior begins with reducing the disproportionate influence of the big hunting, big logging, big oil and other big corporate interests whose big money defined and still define the deadly and devastating land management policies of the Bush Administration. A look at NRA member and Blue Dog Democrat Mike Thompson’s financial and voting records reveals a less-than progressive position with regard to important issues the next DOI Secretary will be dealing with. Environmental groups are especially concerned, for example, that, among Thompson’s biggest contributors ($20,676) is Safari Club International, a global organization that whose primary mission includes lobbying for the right of trophy hunters to hunt as many species as possible, regardless of their endangered status. Earlier this year, Thompson was awarded SCI’s Federal Legislator of the Year award for his votes on several pieces of legislation, inclding a bill that allows hunters in the United States to continue importing the heads and hides of polar bears killed in Canada. The vote prompted condemnation of animal rights groups and even moved the Bush Administration to place the polar bear on the “threatened species” list under the Endangered Species Act. Another one of Thompson’s biggest contributors (over $17,000) is Koch (pronounced “coke”) Industries, the largest privately held company in the US specializing in oil and natural resources. The logging units the mega-conglomorate Koch, which earned more than $110 billion in revenue last year, has reaped especially handsome profits from legislation that Thompson has voted in favor of including the Bush Administration’s “Healthy Forest Initiative as well as his votes opening the Tongass Forest and other public lands under DOI management to logging. All prominent California Democrats and Democrats from state’s with some of the largest public land holdings and national forests, inclduing Washington and Oregon, voted against the Healthy Forests Initiative. This bill reaped enormous profits for Koch Industries.